Corinne Romig Roxby, age 82, passed away on Saturday, June 24, 2017. Corinne grew up in Glenside and graduated from Abington Friends School in 1953 and Mount Holyoke College in 1957. Much of her life was devoted to charitable work. 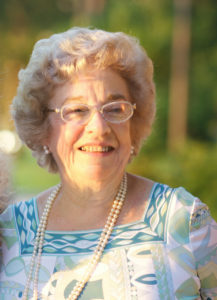 She was a longtime member and supporter of the Fox Chase Cancer Center Board of Associates and Calvary Presbyterian Church where she served as treasurer for many years. She also enjoyed creating and collecting dollhouse miniatures and supported and served on the board of the International Guild of Miniature Artisans. She began collecting with her mother and carried on the tradition of collecting and attending workshops with her daughter Betsy. Shopping of all kinds was a favorite pastime and she was able to put her expertise to use assisting her daughter Susanna at her boutique Quelque Chose in Chestnut Hill. Although she lived primarily in Flourtown, PA her second home and “family” was in Sea Island, GA. She loved to travel and favorite spots were Walt Disney World, Nantucket and London. Family was always an important part of her life. She especially enjoyed decorating and celebrating holidays and carrying on traditions created by her parents Gerald and Thelma Romig. She is survived by her daughters, Elisabeth (Anthony Butler) Roxby, Susanna (Daniel) Forjohn, granddaughters Georgia and Emily Forjohn and dog Lola. She was predeceased by her husband Maj. Gen. William C. Roxby, Jr.
A memorial service will be held Saturday, July 8 at 11:00 am at Calvary Presbyterian Church in Wyncote. Those of you who knew Corinne knew she had an eye for color. So we ask that you honor her by wearing bright colors to the service. Memorial contributions may be made to Board of Associates, Fox Chase Cancer Center, 333 Cottman Ave, Philadelphia, PA 19125 or Calvary Presbyterian Church, 217 Fernbrook Ave, Wyncote, PA 19095.